A growing body of knowledge indicates that climate changes are due to increased concentrations of greenhouse gases such as CO2 in our atmosphere. 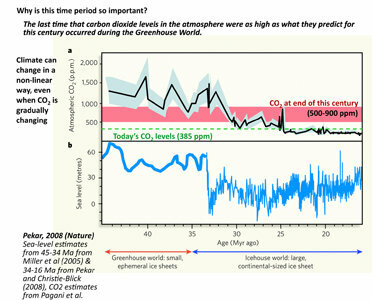 Predictions of future atmospheric CO2 levels expected to occur by the end of this century range from 500 to 900 ppm. The last time that atmospheric CO2 levels were this high occurred between 25 and 45 million years ago. During this time, the ice sheets were either absent or perhaps small ephemeral ice sheets would periodically exist high on the plateau of Antarctica. Additionally, it was also during this period (~34 million years ago) that one of the most dramatic and permanent climatic changes occurred of the last 100 million years: the abrupt change from greenhouse world conditions (older than 34 million years ago) in which ice sheets were either absent of ephemeral in nature to an icehouse world in which large continental sized ice sheets expanded across Antarctica (<34 million year ago). Scientists are still struggling to understand what were the causal mechanisms that resulted in this tipping point that switched the world climate dramatically especially in Antarctica. State-of-the-art climate models, combined with paleoclimatic proxy data suggest that the main triggering mechanism for initial inception and development of the Antarctic Ice Sheet were the decreasing levels of CO2 concentration in the atmosphere and that the opening of critical Southern Ocean gateways only played a secondary role. After the abrupt cooling at 34 Ma, CO2 dropped below 700 ppm and the Antarctic ice sheet was far more dynamic, retreating hundreds of miles inland during warm periods, which resulted in sea level rises of over a hundred feet, while during colder periods, the ice sheet expanded across the Antarctic shelf. Additionally, as this time interval is the last time that atmospheric CO2 was as high as what is predicted for this century and was considerably warmer than today, studying this period may be able to provide us with a glimpse of our future. Although a wealth of data from deep sea and terrestrial records provide a detailed story of climate changes at low and mid latitudes, first-order questions remain about how climate and the ice sheet changed in Antarctica. Resolving these questions is important as polar ice affects global sea level, ocean circulation heat transport, marine productivity and planetary albedo and are key pieces in understanding the modern climate system. With current rising atmospheric greenhouse gases, resulting in rapidly rising global temperatures (IPCC, 2007) studies of Polar climates are prominent on the research agenda. Antarctic ice sheet dynamics and stability is of special relevance because, based on IPCC 2007 forecasts, a CO2 increase of 2-4 times pre-industrial is predicted for the end of this century, conditions not experienced on Earth since at least 24 Ma ago, when the Greenland and West Antarctic Ice Sheets probably did not exist, global temperatures were much higher and East Antarctic Ice Sheet was at times up to 50% smaller than today, resulting in sea level up 40 meters higher than today. Clearly a better understanding of the evolution of Antarctic ice sheet and its climate is needed for these critical time intervals when climatic tipping points occurred. However, a paucity of data currently exists from near or on the Antarctic continent. This is due in part to the difficulty in conducting an expedition in this cold harsh region. In fact, many scientists now agree that the key to the climate puzzle lies literally at the bottom of the Earth: Antarctica. However, so far only a few continuous cores have been recovered on the Antarctic continent or on its shelf from when the Earth was in a Greenhouse World (>34 million years ago). In fact, for many Antarctic scientists, recovering sediments from this period are considered to be one of Antarctica’s “Holy Grails”.